The 2019 Annual Day of Learning was a huge success! We brought together more than 700 students (grades 7-12) and educators from public and private schools throughout California to attend workshops and hear from one of 16 survivors. Join us for the next Day of Learning in San Francisco coming in spring 2020! The JFCS Holocaust Center invites schools and youth groups to join us as partners for the Day of Learning. To learn more about this partnership opportunity, contact Morgan Blum Schneider at 415-449-1289 or MorganB@jfcs.org. The Day of Learning is a program of the JFCS Preisler Shorenstein Institute for Holocaust Education. 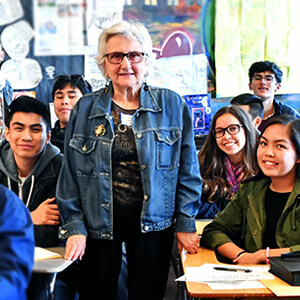 Our 2019 partners include: The Athenian School, Anti-Defamation League, Congregation Emanu-El, Congregation Sinai of San Jose, Facing History & Ourselves, The Genocide Education Project, The Helen and Joe Farkas Center for the Study of the Holocaust in Catholic Schools at Mercy High School, JFCS YouthFirst, Jewish Partisan Educational Foundation, Kehillah Jewish High School, Lehrhaus Judaica, Moreau Catholic High School, San Benito High School District, San Francisco Unified School District, and Stuart Hall High School.